I was a brand-new mom. My in-laws were visiting and wanted to take my husband, me and our precious 4-month old daughter out to lunch. It was a beautiful day, so we drove 30 minutes to a quaint little spot with lakefront seating. As we parked the car and I turned to get my daughter and the diaper bag, I realized with a sinking stomach that our wonderfully, well-stocked diaper bag was still sitting on my kitchen table, 40 miles away. You may as well have taken all my clothes and left me standing there naked because that was how vulnerable I felt without the essentials that basically allowed me and my baby to make it from minute to minute. Needless to say, it was not a smooth afternoon, as my husband and I improvised with everything we’d been able to find in the CVS baby aisle. That was a rookie mistake not repeated, especially as our family expanded with the arrival of twins and grabbing the diaper bag became as essential as grabbing the kids. A well-stocked diaper bag is a must-have for any mom, whether you are constantly on the go or just trying to make it through errands, carlines, and family activities. However, it’s easy to go so laden down that you end up with a bag of junk and still can’t find what you need when you need it. Somewhere between bringing your whole nursery and not having anything at all is the right mix. So to make your list and your life a little easier, we’ve narrowed down what every good diaper bag needs and what to consider when stocking your diaper bag. Diapers & Wipes: Stock enough diapers to allow for changing about every one-two hours. So if you’re out for the day, bring plenty. With wipes, it is easier to take them out of the bulky plastic container and just put them in a re-sealable baggie. Travel wipes are great, but some moms feel they use them too quickly so the baggie may be a better option. Pibu’s Bottom Balm hypoallergenic formula is specially formulated to smooth on skin to create a protective barrier against baby’s wet and dirty diapers. to bring your own. Additionally, since your baby’s skin is oh-so-delicate, don’t skimp on the ointment or diaper cream and assume you can go without when you’re on the go. Some moms choose to use travel sizes to save on space. Wardrobe Change for Baby and You: As you know, your little one goes through more laundry than the rest of the household, so you definitely want a change of clothes. While you probably don’t need the same for yourself, an extra shirt is always a good option as baby fluids and liquids tend to get projectile. Disposable Bags: These are great when you need to put a dirty diaper or a dirty change of clothes in something, separate from the rest of your diaper bag. You can use the sweet-smelling scented bags, recycle your plastic grocery bags or go back to the tried and true re-sealable baggie. Food and Water: Whether your child is eating solids, drinking bottles or breastfeeding, you want to have those supplies on hand. For breastfeeding, it may be as simple as a diaper cloth or blanket over you and your child. Otherwise, include the bottles, powder, formula, snacks and water you need to keep your child full and hydrated. Never assume that you can make it home in time! Loveys and Pacis: Without packing up the whole nursery or playroom, you want to bring along a small, simple toy and a “lovey” or comfort item like a blanket or small stuffed animal. If your child uses a pacifier, pack at least two in the pockets of your diaper bag as one will surely end up on the floor of a gas station or bathroom. A blanket is always a great idea, regardless of what else you bring since you can end up in a store or office where it might be a little chillier than expected. season. Babies over 6 months old should use sunscreen so you should always have some with you. A sun hat is also a great item to have in your diaper bag. (Best sunscreens for babies and kids). Safety First: You’ll never realize how dirty the world is until you become a mom and see everything your child can touch! For this reason, hand sanitizer will be one of your new best friends and should always have a place in your diaper bag. Band-aids and tissues are also a must, especially as your children grow. What about You? When it is all said and done, the last thing you may want to think about is your own purse. To solve this, include your own essentials — wallet, phone, keys, sunglasses and other personal items — in a front pocket or area of the diaper bag. As a mom, you’re probably used to lugging a lot of things around, but the more streamlined, the easier it will be for you! We mentioned earlier that you don’t need to pack your whole house, and it may seem like we’ve done this and more! 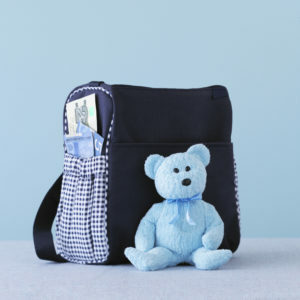 However, a good diaper bag is equipped with pockets and zipper pouches and everything you need to fit these must-have items. If your bag is especially large, some moms prefer to use a diaper bag organizer or caddy that keeps everything in its place. A good idea – going back to those all-important re-sealable baggies – is to organize things so you can always find what you need. One bag with a change of clothes, one bag with diapers and another for wipes; a bag with creams, like diaper ointment and sunscreen, and then food, bottles and water separately. And most of all, please remember that your diaper bag does not automatically replenish its items. So when you (or your husband) use something, replace it before your next outing. There is nothing like reaching in and finding you have no diapers, and instead find that you have the dirty one from last week – to put a kink in your day!